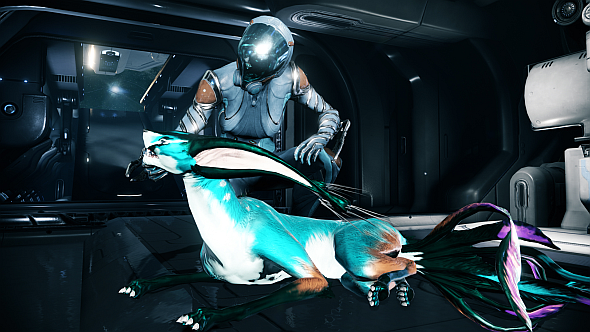 In Warframe, the Kubrow is a furry dog-like creature that can serve as the player’s pets. And once upon a time, there was a pay-to-push button that dropped new, tradeable fur patterns for them. It made them an awful lot of money, but they took it out anyway. Warframe is going from strength to strength, but what are the other best free games on PC? “We wanted people to be able to change [their] fur pattern and colours, so we had a lever, basically. For all intents and purposes it was a button you could push, and if you wanted to pay so much platinum [a real-money currency], you can change the colour. And you can take a print of that and trade it to someone else. “So we were trying to give you a way to get something cool and give it to your friends. And we saw a guy pull the lever like 200 times. And it was just like, ‘oh my dear God, what have we done? We’ve created a slot machine.’ And so it was a couple of days, I think, it took us to take that out. That one is a big regret. Monetisation remains a hot topic in the modern games industry, with Battlefront II’s loot boxes dominating the news toward the end of last year. Warframe is free-to-play, but makes its money by selling additional classes (Warframes) and weapons for real money via Platinum. Players can also earn these things through gameplay, though the grind is lengthy. With 38 million registered players and generally positive vibes, Warframe is clearly doing something right, and it’s very cool to see they’ve resisted the temptation to further monetise that huge base with a system like this.